The last time it snowed this much on Hilton Head Island, was in December of 1989. I wasn’t here. I was, however, in a giant leisure van with my parents and siblings, on the way to the Happiest Place on Earth for the second time in my life (big shock to those who know me). It was probably snowing when we left New York to head South for our vacation (because New York and because December). Snow in New York isn’t that much of a catastrophe, because the state is well-equipped to get roads plowed and salted in a timely manner. And so, our party of seven headed towards sunny Florida, quite unaware of what awaited us on I-95 South. This was 1989, remember—those dark ages before social media. The snow really started coming down as we hit the South Carolina/ Georgia state line. Having just made that trip in February, we knew it should take about 90 minutes to get through that small patch of I-95 before hitting Florida. That day, it would take eight hours. We had almost made it to Jacksonville when the authorities started directing people off of I-95 and shutting down portions (I’m going to guess mostly bridges) that were deemed too icy for travel. On what was supposed to be our first magical evening in Walt Disney World, we spent the night (in a van!) in a McDonald’s parking lot in Callahan, Florida. The next morning, my father was determined to get us to our destination, come hell or high water. He was a New Yorker, damnit; he could drive in snow and ice. Much to my mother’s dismay, he maneuvered around multiple roadblocks on many back roads down the middle of the state of Florida until finally we arrived. I can still remember the pretty sight of orange trees encased in ice. This memory came to mind as we welcomed snow, yet again, to the Lowcountry. What a beautiful sight it was, and yet a third reminder from Mother Nature in less than two years of how small and insignificant we are. 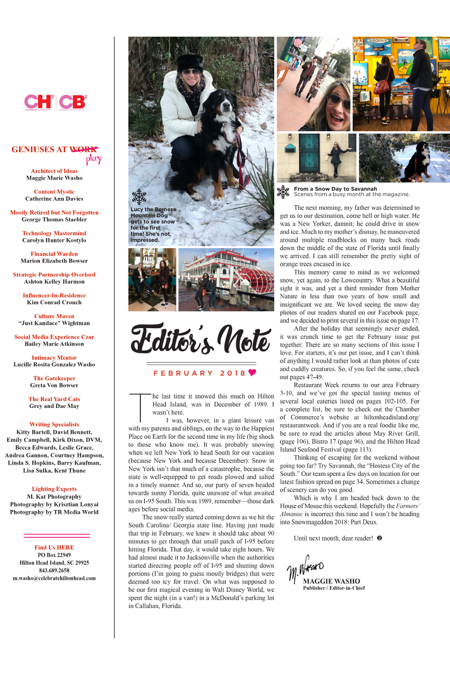 We loved seeing the snow day photos of our readers shared on our Facebook page, and we decided to print several in this issue on page 17. After the holiday that seemingly never ended, it was crunch time to get the February issue put together. There are so many sections of this issue I love. For starters, it’s our pet issue, and I can’t think of anything I would rather look at than photos of cute and cuddly creatures. So, if you feel the same, check out pages 47-49. Restaurant Week returns to our area February 3-10, and we’ve got the special tasting menus of several local eateries listed on pages 102-105. For a complete list, be sure to check out the Chamber of Commerce’s website at hiltonheadisland.org/restaurantweek. And if you are a real foodie like me, be sure to read the articles about May River Grill, (page 106), Bistro 17 (page 96), and the Hilton Head Island Seafood Festival (page 113). Thinking of escaping for the weekend without going too far? Try Savannah, the “Hostess City of the South.” Our team spent a few days on location for our latest fashion spread on page 34. Sometimes a change of scenery can do you good. Which is why I am headed back down to the House of Mouse this weekend. Hopefully the Farmers’ Almanac is incorrect this time and I won’t be heading into Snowmageddon 2018: Part Deux. Until next month, dear reader!